Dihydrocodeine is a semi-synthetic opioid analgesic. 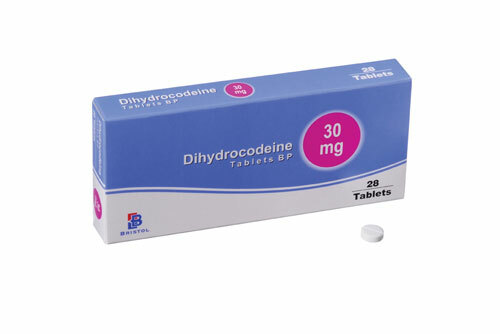 Dihydrocodeine can best be described as a moderate pain reliever. It is used to help manage pain caused by sciatica, osteoarthritis, rheumatoid arthritis, blood vessel disease, and cancer, among other conditions. Dihydrocodeine works in the central nervous system. It changes the way that the body feels and reacts to pain by binding to the body’s opioid receptors, which play a key role in transmitting sensations of pain and pleasure throughout the body. By binding to these opiate receptors dihydrocodeine is able to block the transmission of pain signals from the brain to the body’s nerves, subsequently diminishing the body’s ability to feel pain and increasing an individual’s comfort level. In addition to its use as a pain reliever, dihydrocodeine may also be used as a cough suppressant. Because of its addictive nature dihydrocodeine is not recommended for long-term pain management. Withdrawal symptoms may occur if an individual stops taking dihydrocodeine after prolonged use, including irritability and restlessness.